The twenty-one grads and undergrads accepted into Professor Barry's course have been warned, via the illustrated letter above, handwritten on legal paper, that the workload will be heavy. - Ayun Halliday 's most recent book is Peanut. This sounds like a course I will actually stick with even though taking it solo. I haven’t touched a crayon in decades. But reading this piece about Ms. Barry’s course caused me wax nostalgic. I bet no one cuts this class. This sounds like great fun. 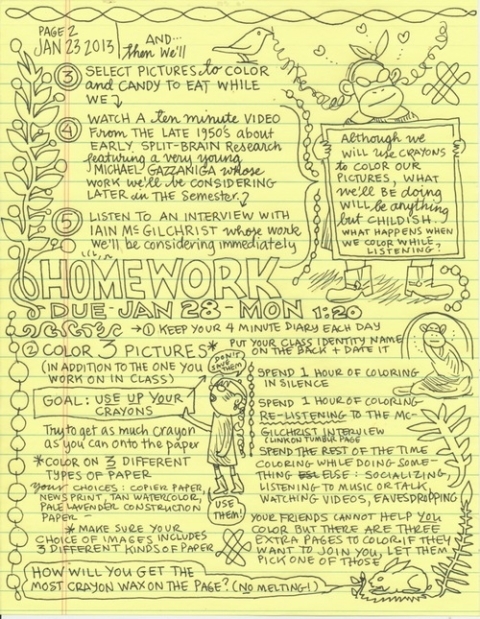 I’ve doodled in the margins (and sometimes all over the pages) of every notebook in almost every class I’ve ever taken. I’m probably one of the few college-level instructors who actively encouraged her students to do the same. I’ve suspected my personal theory on the subject had good scientific backing, but I’ve never explored it fully. I want to see what doodling does when combined with my writing/poetry. This course smells of crayons and piles of paper. I’m in. I have degees in Art, Chemistry and Neuropharmacology. @Donna Omo – When I was an assistant chemistry teacher for the Upward Bound program, I encouraged my students to doodle. Keep your pen moving. I love finger paints and crayons. I think the course will be a challenge if you don’t actually meet in a classroom. I have to doodle to concentrate if I’m listening to someone but not interacting (eg its a lecture not a discussion). If i dont occupy that bit of my brain which controls my doodles my mind wanders off almost instantly. I have always been a compulsive doodler, especially when talking on the phone when I go into an uncontrolled state and any piece of paper no matter how valuable is likely to contain shapes that turn into schools of fish or other critters. I keep my birth certificate in a special place so it is safe from my pen. I’ve decided to make a photocopy of it and make it one of my papers and it may be the first page of the rest of my life story. what a fun class! I wish I could attend. I’ve long been a proponent of coloring and especially encouraging grown-ups to color. I have successfully doodled my way through 2 spiritually rich, medical adventures through breast cancer. It’s a powerful tool – an opened-eye meditation that can teach you about the healing power of letting go of the end result – the unknown future- and stay focused in the “Now” moment in time. Aside from my knee-jerk irritation at any and everyone from psychologist to kindergarten teacher relabeling themselves a neuroscientist (I am an actual neuroscientist, studying actual neurons and what they actually physically do, with an actual PhD in neuroscience) this looks to be a fantastic class. Although I have been following the course from home, there are a lot of things that I don’t know what she is talking about, such as house on fire, draw a car, other people’s houses. I guess these things are assigned or presented during the class, that we can’t participate in by just viewing the tumbler….sigh….I LOVE Professor Lynda & have admired her work since the ’80’s. Maybe someone can post the in-class work briefly so we home folks can understand what’s going on. Thank you!! Heard your interview with Neil Cohen and was awash with creative questions and answers…I teach art to delinquant kids in France and I find the key to getting them motivated is my own investment in creation…at the end of the eight day atelier I’m exausted but exhilarated! It’s a high…when it works. Prof Linda’s atitude and overview is like a breath of pure O2!!! would love to join this course on Doodling and Neuroscience. Is there a class starting in 2014? I have always wished that I had been born at artist. However, I can’t draw to save my life. I sometimes doodle when I’m on an important phone call. I only draw triangles and squares. Sometimes profiles or just cat’s eyes nose, whiskers, and ears. They’re very simple. I wonder if it helps to concentrate. Thanks, this has been quite insightful and interesting. I love to color. Lynda Barry is a Heroine. Our public schools should be using her ideas in the curriculum. Is this a 2013 class, or is it offered now? how do i do this course? Hello. I was going to say, pardon the Old Lady question, but I’m glad to see some others are asking the same. How do I sign up for this, please? Thank you. 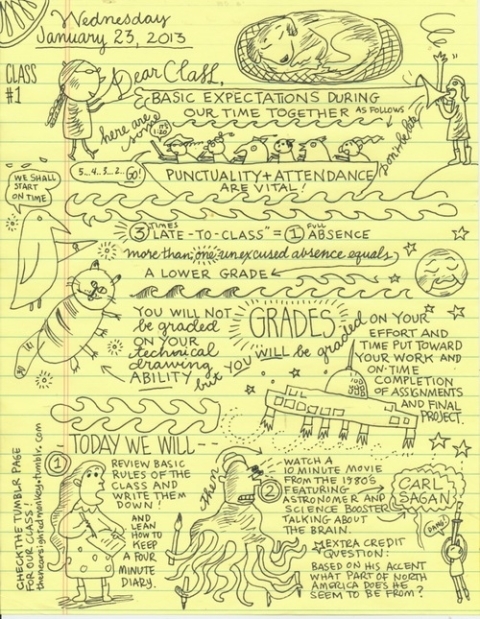 I would love to know how this course went, and would Lynda Barry do it again?? I would love to take the class. could I have a quick .pdf of the lesson plans if they are available, and if there won’t be another class?